Lots of bags of sorted socks waiting to be delivered to the homeless by The Joy of Sox. On Sunday March 19, several volunteers helped organize and sort 3,550 pairs of socks for the homeless. These socks were recently collected from various school sock drives around the Philadelphia area. The socks were sorted into bags of men’s, women’s and children’s socks. The children’s socks were sorted for ages 0 – 5 and 6 – 13. The photo show some of the bags in our storage facility. Each bag contains between 36 and 52 pairs of nice new socks. The bags will be delivered to facilities in Philadelphia, Montgomery and Chester County, PA in the next two weeks. 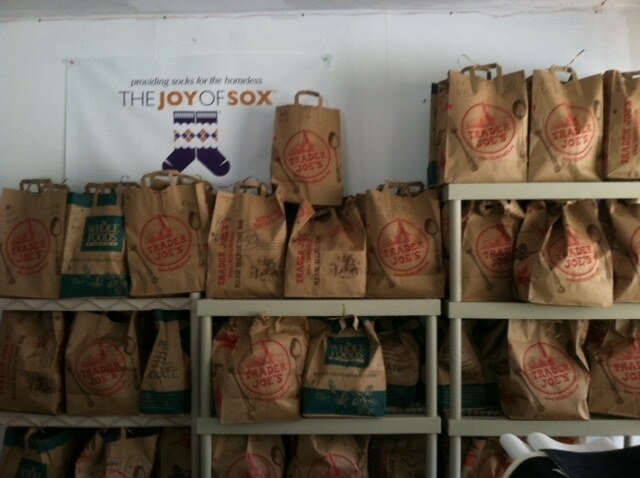 Thanks to Whole Foods and Trader Joe’s for supplying the bags. And lots of thanks to our volunteers who spent part of their Saturday bagging socks!